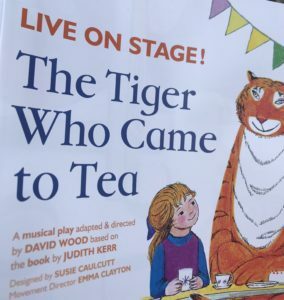 The Tiger Who Came To Tea is a lovely outing for families and is a great way to gently introduce little people to the theatre. It’s not as loud and shouty as a panto and has just the right amount of interaction to keep the children engaged. I saw it with a 15 month old and an almost-3 year old and they joined in and watched intently as one of their favourite books came to life. The tick tock of the clock, the counting and the action songs all added to the enjoyment and there were a fair amount of adults joining in too. For many of us, this has been part of our childhoods and those of our children. This is the story of an ordinary day being interrupted by an extraordinary event – a full size tiger who comes to visit. The tiger was so well-mannered and it was enchanting to watch as he endeared himself to the family. He then proceeded to eat his way through the kitchen cupboards, and this was done so cleverly. I loved how the tiger magically made items disappear as he munched his way through cakes and packets and tins, catching the attention of the older children, and the adults. This is a must-see for the summer holidays, particularly if the hot spell endures, as the theatre is lovely and cool. I’m planning on going again with a reception-aged nephew as I think he’d love it too. The Tiger Who Came To Tea runs for 55 minutes and is on at the Piccadilly theatre until early September 2018.